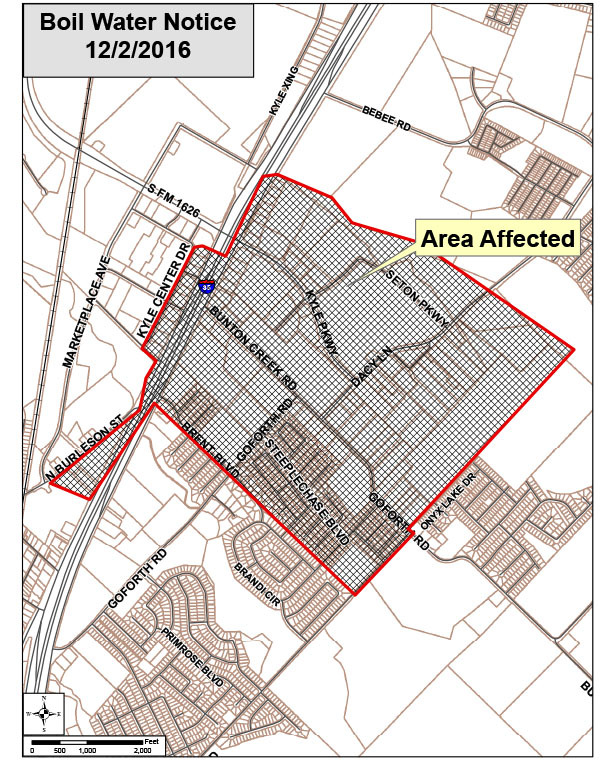 A boil water advisory has been issued for parts of Kyle. The city of Kyle has rescinded a boil water notice that had been in place for areas of central Kyle, according to a press release. Warren Christian, a representative of the Kyle Public Works Department, said in a statement all water samples tested passed and the tests were negative for any bacteria. Public Works Director Harper Wilder said a construction crew working on Bunton Creek Road Friday morning hit a major water main and ruptured it, causing a leak. The city of Kyle has issued a boil water notice for numerous residents in the central part of town after a contractor damaged a major water main, according to a press release. Kim Hilsenbeck, Kyle Communications Specialist, said the break occurred in the area of Goforth Road and Bunton Creek Road early Friday. Hilsenbeck crews have shut down a leak associated with the water main break and have diverted water to Seton Hospital and Fuentes Elementary, which are in the affected area. However, Hilsenbeck said the city opted to issue a boil water notice as a precaution. The city executed it’s reverse 911 system to contact affected residents. According to the release, the Texas Commission on Environmental Quality (TCEQ) has required the city to notify customers of the need to boil water prior consumption. “To ensure destruction of all harmful bacteria and other microbes, water for drinking, cooking, and making ice should be boiled and cooked prior to use,” according to the city’s release. Water should be brought to a vigorous, roiling boil and then boiled for two minutes. Residents are also encouraged to purchase bottled water or obtain water from another suitable source in lieu of boiling, according to the release. Officials will notify residents when water is safe for consumption. This story is developing. We will provide updates as they become available.